Scott Bishop worked as Associate Principal, Project Manager, and Designer while at Stoss to design Erie Street Plaza. The plaza is an open space catalyst that promotes flexible social interaction while creating a positive impact on the environment. Erie Street Plaza is part of the Milwaukee Riverwalk, a two-mile corridor that connects and provides access between three waterfront neighborhoods: the Historic Third Ward, Downtown, and Beerline B, as well as providing access to multiple restaurants, brew pubs, shops, and other public spaces. The plaza is designed as an adaptable space that encourages social activity while advancing and supporting ecological processes. Plaza programming ranges in size and purpose, from festivals and weddings to fishing and carnivals, and from informal gatherings to coordinated events. 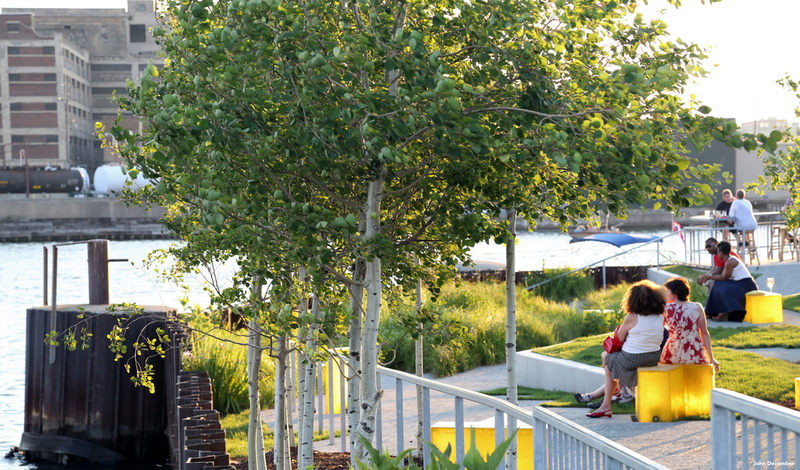 Ecologically, the plaza incorporates mechanisms that collect stormwater runoff, aid in repairing marshland conditions, and contribute to groundwater recharge.